With Square for Retail, rather than using your email address and password to sign in to the Retail POS app, you’ll need to create a device code. A device code can only be used on a single device — so if you have multiple registers at a retail location, create a unique code for each device accessing the Retail POS app. Once you create a device code, you can sign in and start taking payments. 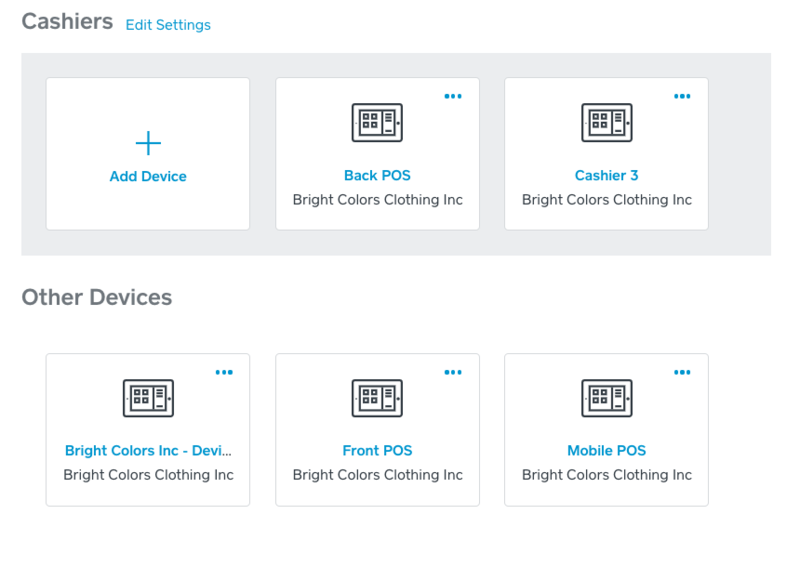 If you’ll be using the same device settings for multiple devices, you can create groups to streamline the process for setting up your points of sale. Note: Although your monthly subscription fee of $60 per location includes one free device, you’ll be charged $20 for each additional device you create per location. Read more about subscription pricing with Square for Retail. If you’re just getting started with Square for Retail, learn more about setting up your account. Log in to Points of Sale > click Create New Device. Click Retail > choose the device settings > Create. Enter your phone number or email address to receive a message with a copy of your new device code. Use your new device code to sign into the Retail app. Note: Keep your new device code somewhere safe, you’ll need it to log in to the Retail app. If you’re planning on using the same device settings for multiple points of sale, you can create shared settings to help you setup your devices quickly. To help locate, manage, and update your devices, search the device name or filter by location to get started. Click on a device you’ve created > toggle on Manage Device Using Shared Settings. Select Create New Setting. Choose your settings — including receipt type, tipping, and cash management preferences. Once you’ve finished setting up your shared device settings, you’ll see the option to add any device to the groups you’ve created — including existing devices. Click on the device to update > toggle on Manage Device Using Shared Settings. Choose Select Settings. You can select an existing settings group, or create new shared settings. Devices not assigned to a specific shared settings group will be listed in alphabetical order under Other Devices. The receipt options give you control over how and when your customers sign for their purchases. You can decide whether you want your customers to sign printed receipts or directly on the iPad, and whether you wish to require a signature for all transactions or only those exceeding a purchase total of $25.00. Included in your Square for Retail subscription is full access to Employee Management. Determine how your employees interact with the Retail app: whether you would like your employees to clock in and out so you can track their time, and whether you would like to have a session timeout that would require entering the passcode after a certain time of inactivity on the Retail POS. When tipping is enabled, your customers can add a tip to their purchase. You can choose whether to add tipping options to the signature screen or display them on a separate tipping screen. 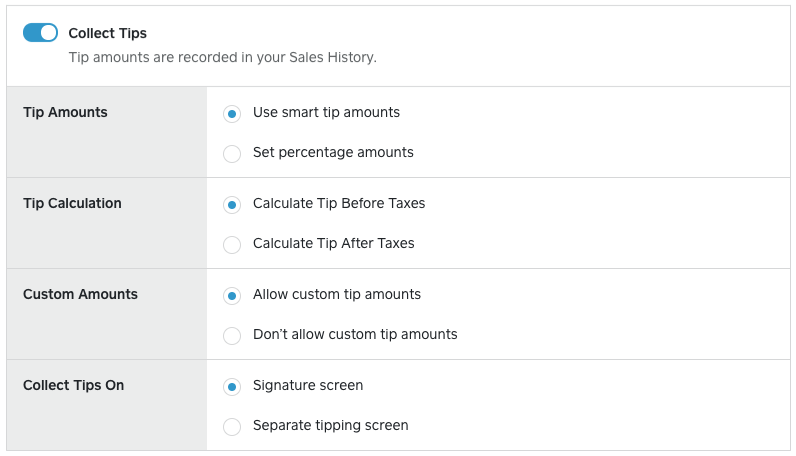 You’re also able to pick between suggested smart tips amounts or percentage amounts, and give your customers the option to enter a custom tip. This setting allows you to manage a cash drawer — whether you would like to track cash added to or removed from the cash drawer outside of transactions or refunds. This would make the Add Paid In/Out feature available on the More menu of the Square Retail app. You can set a default starting cash amount, and customize settings so that a cash report is printed once the cash drawer is closed or automatically sent to the email address of the employee provided. You can swipe card payments in Offline Mode when your internet service is temporarily unavailable. Offline payments are processed automatically when your device regains connectivity. Keep in mind though, the payments taken in Offline Mode will expire if they are not processed within 72 hours. Read more about using Cash Management with Square for Retail.